In order to properly and successfully run a business, business owners and their managers typically have habits that keep them well organized which aid in their success. Being organized helps to save time, energy and frustration. This allows employees to focus on more important tasks and therefore are more productive. For some people, being organized comes naturally and others need to learn some skills and habits to be organized. If you are the type, like the majority of us, that need to learn these skills and habits, here are some of the habits of organized business owners and managers that can get you started. These habits may be able to help you organize your sign shop, organize your print shop or whatever type of business that you run. 1. Organized people tend to have a positive mindset. Every action a person takes stems from an inner thought. Our thoughts are often based from our inner core beliefs. People who think optimistics thoughts tend to want to be more organized. They tend to want to have things in order. So, they take action to make sure their life and business are organized. When they are organized, this also helps to maintain their positive mindset. shopVOX solution: If having trouble maintaining a positive mindset, you can send a note to yourself as a reminder. Keep doing so and you will soon have more positive mindset. 2. Organized people focus on what’s important first. There are so many ways to be distracted while at work. Our smartphones and social media are often the biggest distractions these days. Also, it’s tempting to want to complete the tasks we enjoy the most or are easier to finish before the most important tasks. shopVOX Solution: You can set priority levels and due dates to jobs in shopVOX that make it easy to know which jobs need to be completed first. 3. Organized people delegate. As a business owner and manager, you know that you can’t do it all on your own. You need to delegate responsibilities and tasks to your staff and then give them the space to prove themselves. When employees clearly know what their tasks are, they tend to take more pride in their work and get things done. shopVOX solution: Assign tasks and jobs to your employees in shopVOX. Assign dates and details. When they are complete, you will be able to see so in shopVOX. 4. Organized people are aware of their inventory and resources. Inventory management is vital for production in a custom manufacturing company, retail outlets and other companies. An organized person knows what is in stock and what is needed. In addition, they have a system that helps them monitor their materials, inventory and other resources efficiently. shopVOX solution: Take advantage of the resource management in shopVOX. You can easily keep up to date with what’s available and what is not. 5. Organized people have a place for everything. When you know where something is, you can work more efficiently and reduce your stress. Filing cabinets, drawers, work spaces, installation areas and computers can all be organized and labeled to make it easier for everyone on your team. shopVOX solution: Input all of your sales leads, customers, quotes, and job into your software. There is a place to organize all of these as well as so much more. Then, with a few clicks, you will simply be able to find whatever you are looking for. 6. Organized people take time to destress. Organized people tend to know that they need to take breaks every once in awhile. Destressing for a few minutes by taking a walk, stretching, or something they enjoy helps to recharge. Destressing by taking a vacation can greatly help reinvigorate a person. 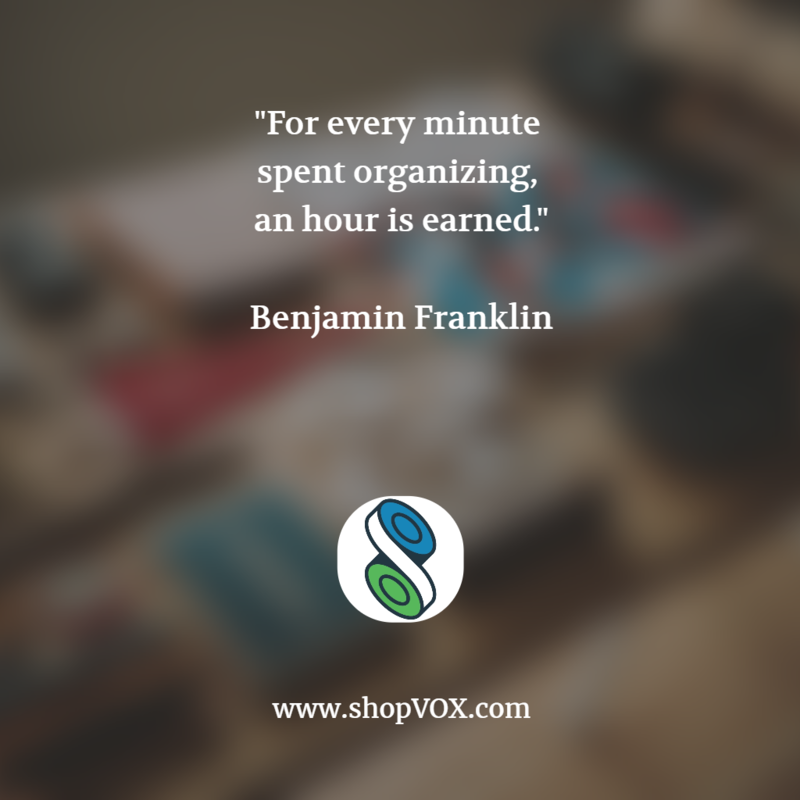 shopVOX solution: As a shopVOX user, you know that you are organized. So, it’s so much easier to take a break when needed because you have more time available and because you know that at any second you can easily check in with your business to ensure everything is running smooth. 7. Organized people seek out tools. Tools are extremely helpful in keeping you organized. We use holders for pens, paper, and other commonly used items. We use filing cabinets to store files. We use trays, racks, and shelves to store our materials, supplies and tools. We use computers and software to store our information. Thank goodness for all of these tools to help us! shopVOX solution: The most effective and efficient, yet comprehensive tool to organize your custom business is shopVOX. You can organize your customers, staff, jobs, projects, quotes, invoices, materials, resources, and so much more with just this one tool! So, take advantage of shopVOX and use it everyday. You will definitely become more organized! Becoming organized takes time initially, but it will save so much time in the long run! Learn to incorporate some of these habits into your life and be a more organized person. You will feel less stressed and more productive. To learn more about shopVOX, try a free 15 day trial today. No credit card is needed to sign up. All you need to do is try it!